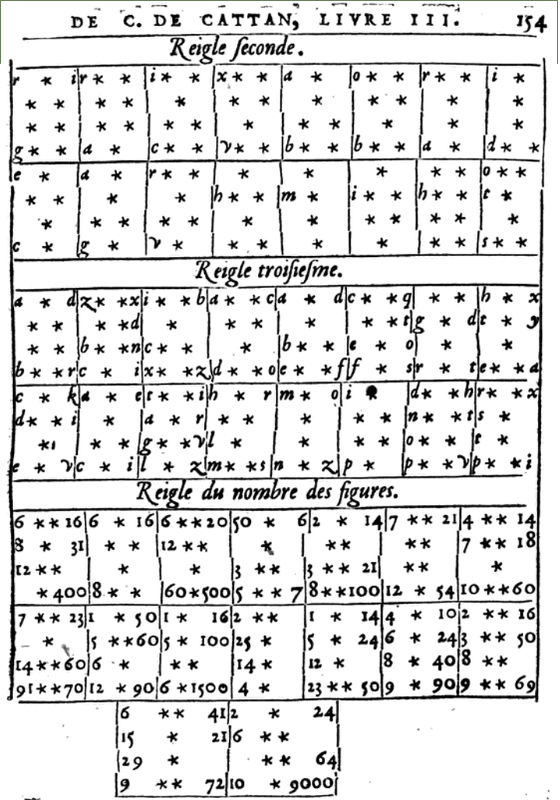 Of all the techniques of Western geomancy, that of company is one I’ve always been kind of iffy about. It’s something I teach about regardless, as it’s been vetted by greater geomancers than me, but I’ve never really seen the use of it. Lately, after going over some ideas with a student of mine, I’ve been giving it a bit more thought about where it falls into the repertoire of geomantic techniques and how it might be expanded or elaborated on. This is more a blog post of brainstorming than exposition, so please bear with me, folks. When you find a good figure in a good house, it is double good, because the house is good and the figure also, and it signifieth that without any doubt the Querent shall obtain his demand. By the like reason if ye find an ill figure in an ill house, it is very ill for the Querent, but if ye find a good figure in an ill house, it signifieth good to the Querent, but it will not continue, but taketh away some part of the malice of the house: in like case if ye find an ill figure in a good house, it taketh away the malice of the figure, for she would do harm, but she cannot, keeping always that the good come not to the Querent: and for as much as in this Chapter I have promised to speak of the company of figures, I will that you do understand that this company is of three manners, whereof the one is simple, the other demi-simple, and the third compounded. The company simple is of two like figures, as by example, if that you find Aquisitio in the first house, and likewise in the second, and so likewise of all other figures which in two houses next together be found both of one sort, as if Conjunctio be found in the third, and likewise in the fourth. When in two houses next together, there be found two figures a like, and that they be good, ye shall say incontinent that they signify great goodness, and if they be ill, they do signifieth much ill: as by way of example, if ye find in the fifth and ninth Rubeus, ye shall say that it signifieth much ill to the Querent, for the question demanded, and to declare unto you more easily, you must know that the second house is always companion of the first, the third of the of the fourth, the fifth of the sixth, and so consequently of the others. If therefore they be both of one element, of one Planet, and of one Sign, they signify much good or much ill, according to their goodness or malice. If they be good they signify that the hap and goodness of the Querent shall be as well good present as in time to come: as much shall ye judge of the contrary part if they be evil, and yea because that the first house signifieth the time present, and the second time to come, and likewise of the other companies. The company demi-simple is, when tow figure be not both of one sort, nature or condition, although they be both of one Element, and of one Planet, so as the one party do agree, and the other not, as by example, if it happenth that the first be Aquisitio and the second Leticia, although they be both of the Element, of the Air, and of the Planet ♃, yet they be diverse significations, for that the one of them is of ♃ direct, and the exaltation of ☉, and the other of ♃ retrograde and the exaltation of ☾ the one of the figures of ♈, and the other of the Sign ♉. The company compound is that which is of diverse figures made one contrary to another, as if Aquisitio be in the first house, and Amissio in the second, of which the two cometh and is engendered the figure Via, which is a figure of the Element of Water, signifying a conjunction of ☉ and ☾, which is a triple and compound company, evil and of great discord, by reason that Aquisitio is a figure of the Element of the Air, and of the Planet ♃ in the figure of ♈ Amissio a figure of the Element of the Fire, and of the Planet ♀ in the Sign of ♏. Which maketh and engendered the difference of them, and the diversity and discord which they have together, out of the which two, as I have said before, is engendered this figure Via, which is a figure of the Element of the Water, and of the Planet ☾ in the sign of ♌, and is thus contrary to both the others. Now see how the company is ill, and that is the cause that when it cometh it cannot be judged. And thus all of the others according to the importance of their signification, be it good or be it evil. There is moreover another company of figures which be taken by points on high of the said figures, as by example if Aquisitio be in the first house, and Albus in the second, the which because they be both good figures, and be equal of points in the upper part, and that out of them is taken another which is Caput draconis likewise equal in the upper part, it is thereby signified that both they be of great force in things good and hot, and that by the occasion that the fire is the first next unto the Planets, and principal Elements of all the other, unto whom the first points of the figure be attributed. And for that cause I have set in the first book the Chapters as well of the Fire, and of the other Elements, to the end you may know their virtues and properties. As much and for the same reason, I have made a Chapter, in the which I have showed the form and manner to set the figures by lines, attributing the first to the Fire, as to the first and superior and principle Element of all the other, the second to the Air, the third to the Water, the fourth to the Earth. In the which, because that Aquisitio is in the first house, and hath two points on the head, and that his companion [Puella] hath but one, & by that cause do not very well agree together: but because they be both good figures in case of love, I judged that he should obtain his purpose, but not without great pain and travail, because the company agreeth not very well. And because that the figure which cometh out of them [ninth house, First Niece as child of First and Second Mothers], which is Cauda draconis, resembleth the second in the superior points, which points be attributed unto the Fire, by that is signified that the party Querent shall enjoy his desire. And because Aquisitio is in the house of the demand [first house? ], because he hath two points in the upper part, it is a figure which doth much participate of the Fire, rather alone then the two together as touching the company [meaning that two points in a line is doubly active instead of the usual passive]. Because also that it is a figure of ♃ in the sign of ♈, and the exaltation of ☉, it showeth that the love shall be opened, whereby the mother and kinsfolk will be very ill contended: and because Rubeus is in the fifth house I judged that the son of the woman by indignation, and in anger would go about to kill the said Gentleman: and because the company of the fifth [sixth house] called Leticia, which is the sixth, is good: I say that the said Gentleman should dispend much money in the suit of this woman: and because the eleventh is a figure of ☉ [Fortuna Minor] and a company of an ill figure [Amissio in the twelfth house], I judged that his friends should promise to help and succor unto him, but they would not do it until it were too late, so that finally he should lose all his hope of tarrying for the attainment of his hearts desire. But for that the seventh is a good figure, and attributed unto ♃ as the first is, I said that it should be a sign that the woman should love him well, and by that means should in the end marry with him in spite of her children and kindred. Which thing afterward came even so to pass, so that I riding post with my Lord of Thays, going to Rome, was advertised thereof and found my figure true, and that the Gentleman had married the said Lady: which figure shall serve upon for an example to now how to judge the company of figures. So much for Cattan’s explanation of company. Perhaps surprisingly, I couldn’t find any plagiarized rules in John Heydon’s Theomagia as I usually do from Cattan. While his philosophical pseudopoetic ramblings never fail to give me a headache (pace Dr Cummins), Heydon appears to reference company throughout the text without actually defining how it’s to be used. Unless I’m just that blind or my mind has started to actively block out Heydon’s text from mine eyes, it might be that Heydon simply uses “company” to refer to any figure that’s next to a particular one that we care about, a drastic simplification from Cattan’s rules, for sure. 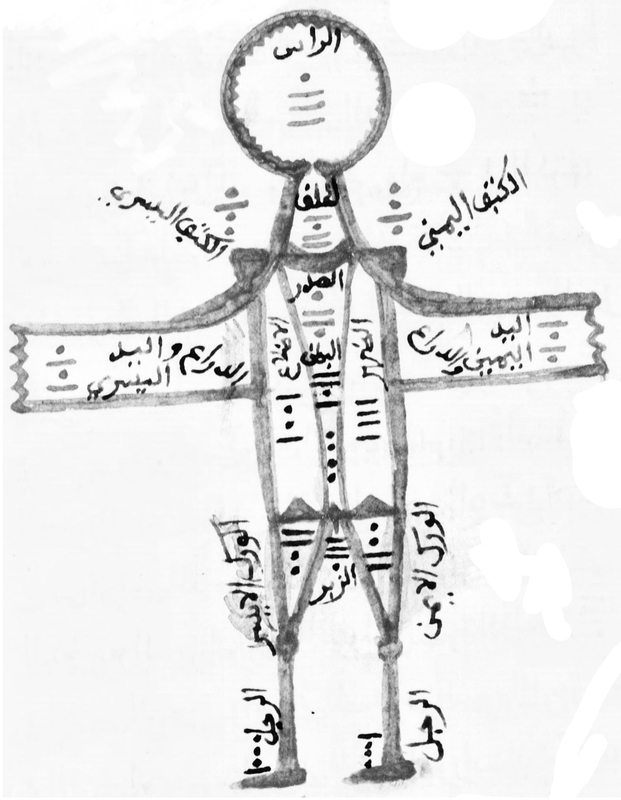 JMG gives a description of company in Art and Practice of Geomancy (pp. 121–122), and I’ll refrain from copying the text here, but generally, he gives the same rules for forming company between the pairs of houses (albeit in a somewhat simplified method from Cattan), and he limits this use to forming secondary significators, or “cosignificators”, to the primary significators in a chart. He says that wherever company exists, other people are necessarily involved in the situation, and we can use the usual rules of perfection with the cosignificator. Thus, a chart perfected through cosignificators indicates that the friends or associates of the party indicated by the significator are in a position to help the party; the figure of company itself can help the geomancer determine the personality and physical characteristics of the person indicated by the figure according to the usual rules. Company can only take place between odd-even pairs of houses in the House Chart: 1-2, 3-4, 5-6, etc., never 2-3, 4-5, 6-7, etc. Company can be formed from one of four methods: simple, demi-simple, compound, and capitular. Company simple is formed when both houses have the same figure. Company demi-simple is formed when both houses have different figures ruled by the same planet (e.g. Albus and Coniunctio, both ruled by Mercury). Company compound is formed when both houses have different figures ruled by different planets yet are reverses of each other (e.g. Albus and Rubeus). Company capitular is formed when both houses have different figures ruled by different planets and are not reverses of each other, but share the same Fire line (e.g. Albus and Caput Draconis). It is possible that, if a significator is in company with another figure, that second figure becomes a cosignificator and can act or stand in place of the significator wherever the cosignificator is. For instance, say that we have a question about whether John Doe will marry Jane Smith, and we find Albus in house I, Coniunctio in houses II and IX, and Puella in houses VII and X. Given this, we see that there is no perfection between houses I and VII, so we would normally say that the chart denies perfection. However, note that houses I and II are in company demi-simple (both Albus and Coniunctio are ruled by the planet Mercury), so wherever we see Coniunctio, we can treat it as acting on behalf of John Doe. In this case, now that we have Coniunctio as a cosignificator of the querent, we see that the chart does, indeed, perfect by mutation in houses IX and X, with Puella and Coniunctio beside each other. In my experience, it’s useful, but not overwhelmingly important in most cases. I’ve had some readings in which it’s been central — for example, one where the querent’s own significator failed to perfect, but the figure in company was all over the chart and perfected in two modes plus positive aspects! It was pretty clear in that reading that the querent wasn’t going to get anywhere in the present, but if he waited and changed his approach he’d achieve his goals so easily it would make his head spin. Worked out, too. In my experience, however, I’ve had to take a different approach for several reasons, which has led me to a different understanding of company. Primarily, I’ve never had a chart where, if the significator didn’t perfect and the cosignificator did, the actual outcome of the situation agreed with the perfection of the cosignificator. In other words, regardless whether the significator perfected, it didn’t really matter what the cosignificator did; it was the perfection or denial thereof from the significator itself that was most in line with the actual outcome of the situation. This could be how geomancy works for me, especially given different results from different geomancers, but I’ve had to tweak my approach to company based on this. Additionally, the process of using cosignificators greatly increased the complexity of a reading, especially if both the significator of the querent and of the quesited had their own figures in company and passed around in the chart on their own. This could easily double or triple the work I’d need to put into a chart, and given that it didn’t yield me any useful information, I find the notion of using these figures as cosignificators rather pointless. Company simple: the significator and their allies are completely in line with each other, from approach to energy, and are identical in all regards. Complete harmony and support. Company demi-simple: the significator and their allies are different, but share enough characteristics for them to complement each other and understand each other enough to accomplish the same thing. Company compound: the significator and their allies are approaching the same matter from different directions and have different results in mind, looking for their own ends, but find a common thing to strive for and will help each other out so that they can each benefit from the whole. Company capitular: the significator and their allies share the same goal, but nothing else in common; they just want the same thing. We can see that, implicit in this order, we have a measure of how strong a given company is, with company simple being the strongest form of company (much like how perfection by occupation is the strongest form of perfection), and with company capitular being the weakest. When it came to the houses involved in company, I heard a theory that the even-numbered house (always the second house in a company pair) represents the future of the figure in company, and that the odd-numbered house always the first) represents the past. I have an issue with this, however: what if the significator you’re inspecting is already in an even-numbered house? Does company, then, only give you information about the past? Not all even-numbered significators have valuable information there, so it seems like this is a gross imbalance of information and, thus, not a useful rule. I haven’t really found much worth in this rule, so I left it by the wayside. For me, if a figure is in company, then the figure matters, not whether it comes before or after the other. So…that’s the general information about company I have on hand. Do I use it? Nope! Besides noting whether or not the querent can call on friends for help, I don’t pay attention to company to determine the fortune or infortune of a person or event, and I certainly don’t use it when determining perfection of the chart. For me, company is a rule that I’ll pull out if I’m really, really trying to squeeze out every last drop of information and every last possibility of perfection from a chart, and if I’m trying to do that, then I know I really haven’t been reading the chart right for some time, or it’s just not the right time to read the chart in a way that makes sense. Besides, the whole rule where a company pair can only be made in an odd-even pair of houses has always bothered me; I know of no such rule in astrology where we focus on odd-even pairs of houses to the exclusion of even-odd ones, so I can’t think of a logical reason why we can’t find company there. Recently, however, a student in geomancy of mine pointed out something I had missed all this time: the odd-even rule comes from the Shield Chart, not the House Chart! Odd-even pairs of houses comes from the placement of the figures in the houses of the Shield Chart, where we have the First Mother (house I) and Second Mother (house II) belonging to the First Triad, the Third Mother (house III) and Fourth Mother (house IV) belonging to the Second Triad, and so forth. That’s why we stick to odd-even pairs, because even-odd pairs would cross those binary divisions in the Shield Chart. This is well, especially since, if we tie in the idea of company into the rule of the triads, we can see why Cattan bothers talking about the figure in house IX (First Niece) when he’s supposedly focused on the company between houses I and II (First Mother and Second Mother). As Cattan doesn’t mention the rule of triads at all, while Robert Fludd does yet neglecting to mention company, it might be that Cattan and Fludd are both describing a similar way to group the four sets of three figures in the Shield Chart that we call the four triads. This would then put the rule of company as a Shield Chart rule more than a House Chart rule. Two parents in a given triad of the Shield Chart may or may not be in company based on the qualities of the parent figures themselves. If two parents are in company, then the matter will have multiple people involved who agree with, help, or defend each other in the matter represented by the child. If two parents are not in company, then the matter will have only one person involved, or there is disagreement or a lack of assistance when the figures refer to multiple people. The child figure in a triad represents the overall outcome of a situation or the theme of interaction between multiple parties, while the type of company or lack thereof between the parents demonstrates the support given to an outcome or means of interaction between multiple parties. Company simple between the parents indicates that the matter will have the concerted, combined, and harmonious action of multiple people, or the uninhibited action of one person supported by all others. Company demi-simple between the parents indicates that the matter will have support and interaction from many sides in many ways, yet not too different as to cause conflict. Company compound between the parents indicates that the different people represented by the parents fulfill each other’s abilities in a complementary fashion. So, those are my thoughts when it comes to company, and how it might be expanded or tweaked to fit in with a more coherent system that uses the Shield Chart more than the House Chart. Before, the rule of company was more than a little confusing in its importance and use, but now I can see a bit more use and interesting qualities in it when put into the context of the Shield Chart. As before, I think it’s a good way to keep Shield Chart techniques and House Chart techniques separated, even though they ultimately rely on the same figures generated by the same process; I think the use of company when applied to the houses makes less sense than the use of company when applied to the triads.